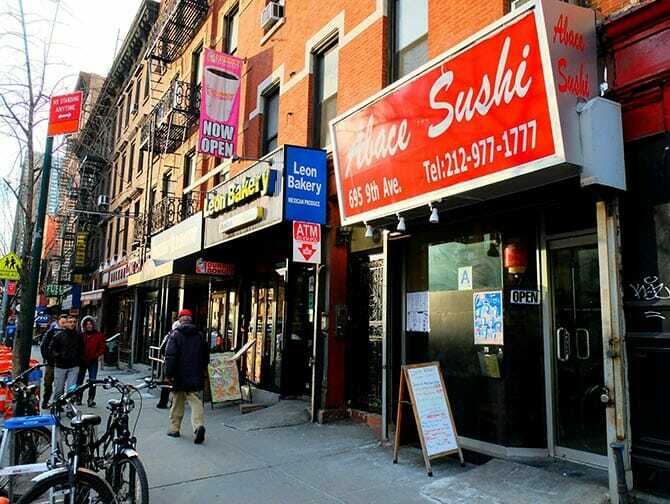 Due to the use of fresh fish, sushi in New York doesn’t come cheap. This top 6 has some great value for money options though. Still a bit pricey? Prices on the lunchtime menu are often cheaper than the ones on the dinner menu! Abace Sushi might not be known for serving the best sushi in New York, but it’s my personal favourite and I’ll tell you why. First of all it has plenty of options, secondly it’s far from being touristy, thirdly it has great prices and fourthly the special rolls are all worth a try. It’s only a small restaurant, seating sixteen in a simple setting. 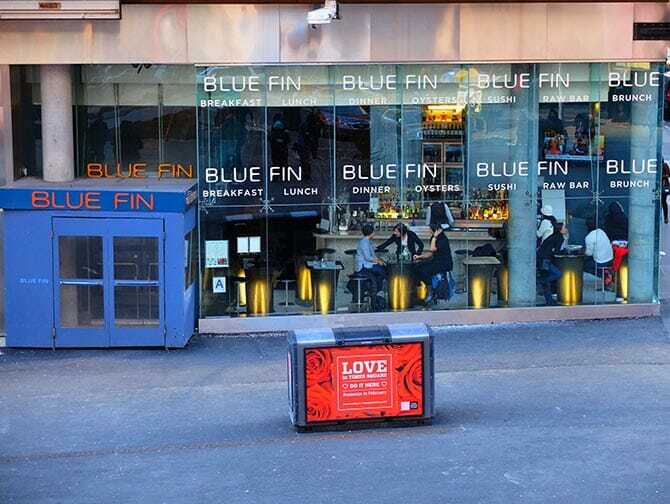 Try to grab a seat and squeeze in with the locals for a nice lunch or dinner. My tip: try the Volcano Roll and the Colourful Dragon Roll. It may require some sacrifices, but to see (and eat at!) this place they’re definitely worth it! Nobu New York is an upscale sushi restaurant. This ‘super sushi place’ comes highly recommended; as the bill will indicate! I personally think it’s a little less atmospheric than Blue Ribbon, though the price and quality are around the same. Actor Robert De Niro is one of the restaurant’s co-founders and chef; Nobu Matsuhisa is a pioneer of Japanese cuisine. He was trained in Tokyo and lived in South America as well as on other continents. This specific influence is what makes his dishes so noteworthy. Dishes indeed, since he serves a whole lot more than sushi. Why not try lobster with wasabi pepper sauce? And his famous cod in miso! Want to grab sushi on the go? It might surprise you, but Whole Foods also belongs in this top 6. This is one of those supermarkets where they prepare fresh sushi all day long. 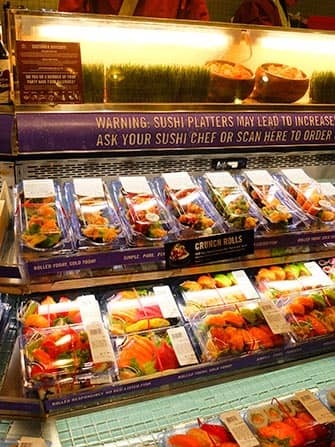 The in-store sushi bar is called Genji Sushi. You can choose the fresh ready-made sushi, or you can give a special order and wait a few minutes till it’s ready (or do some other groceries in the meantime!). This supermarket sushi is great value for money, they’ve even thought of health freaks (brown rice and quinoa sushi) and it’s at a great location as well. Eat some of the best sushi in New York on Columbus Circle or, even better, in nearby Central Park! 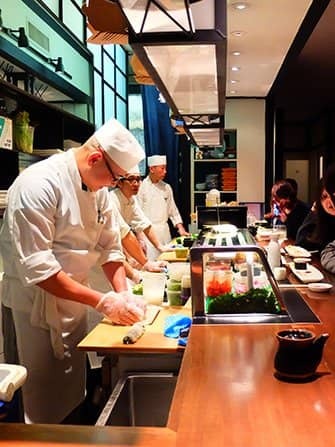 The food at Takahachi in TriBeCa is fast, fresh and good. It’s not cheap, but for New York it’s not expensive either. They offer regular sushi, but also some special rolls that sushi restaurants in New York are known for. They have some unique names as well, like the Godzilla and the Taxi Driver. Takahachi also has a restaurant in the East Village.